WASHINGTON — The Trump administration on Monday banned all use by Americans of Venezuelan cryptocurrency, saying that its introduction is intended to skirt U.S. sanctions. Trump said the cryptocurrency was an “attempt to circumvent U.S. sanctions” imposed for democratic backsliding. In an executive order issued on Monday that took effect immediately, President Donald Trump declared illegal all transactions related to Venezuelan digital currencies, coins or tokens. The prohibition applies to all people and companies subject to U.S. jurisdiction. The move follows the introduction last month of a Venezuelan cryptocurrency known as the “petro,” for which the government says it has received investment commitments of $5 billion. In the executive order, Trump said it was an “attempt to circumvent U.S. sanctions” imposed for democratic backsliding. The Treasury had said in January that the petro appeared to be an extension of credit to Venezuela and warned that transactions in it may violate U.S. sanctions. In February, cash-strapped Venezuela became the first country to launch its own version of bitcoin, the petro, in a move that President Nicolas Maduro celebrated as putting his country on the world’s technological forefront. 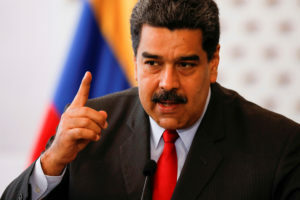 Maduro had announced late last year that he was creating the digital currency to outmaneuver U.S. sanctions preventing Venezuela from issuing new debt. The government has promised that Venezuelans will be able to use the $60 coins to pay taxes and for public services. But with the Venezuelan minimum wage hovering around $3 a month, it’s unlikely citizens will buy in large amounts.